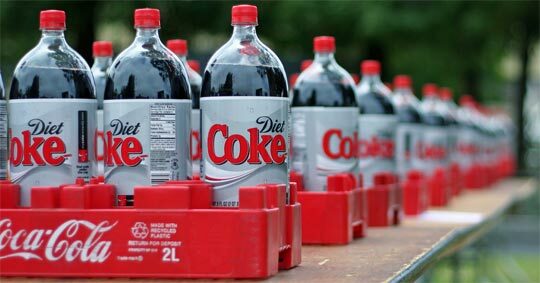 Diet Coke is the third most popular soft drink in the United States with around 9% off the nation’s market share, behind regular Coke and Pepsi. (March 2011 update: Diet Coke has surpassed Pepsi for #2 in US market share). As far as flavored, low-calorie water is concerned, Diet Coke is addicting. Before getting into natural food, it was a staple of my day. But I burned out, and then I changed my eating habits. The major difference between regular Coke and Diet Coke is the use of aspartame as an artificial sweetener. Aspartame is a controversial figure in the world of zero-calorie sweeteners. Critics will tell you that it’s a significant health risks. Supports will say that the proof of its safety is in the millions of drinkers who haven’t suffered any apparent problems. Diet Coke’s brown comes from ammonia-process caramel color. Critics argue that ammonia-processed caramel color should not be labeled as a natural additive. They also play up health risks associated with this grade of coloring — chemical reactions result in the formation of 2-methylimidazole and 4 methylimidazole, two molecules identified as potential carcinogens in a study with lab rats. Used to give Diet Coke a tangy taste. Phosphoric acid is naturally present in ginger and lemons. In higher concentrations, it’s also used as an industrial cleaner. Potassium benzoate is the hallmark preservative of low-pH (high acid) sodas. It inhibits the growth of bacteria and mold, giving your carbonated beverage a long shelf life. There is health danger with potassium benzoate — benzoic acid will naturally convert to benzene, a known carcinogen. This reaction is promoted by ascorbic acid, so it’s probably a good thing that it is absent from Diet Coke’s ingredients. Heat and light, however, can also propagate the conversion to benzene.